Alright, meeting again tomorrow night at 7pm. Basic ArduPilot connection, on/off, etc. A lot of this I just need to keep myself on track. The launch prep / launch section will probably get more detail as we get closer to that. Minor updates to the project wiki have been made. Once more, meet tomorrow at 7pm. I ordered two RC receivers last time I was up there, but they haven’t arrived yet. I also haven’t been able to get in touch with Harold yet, who I need to ask about the spare balloons. I will probably finish the cutter thing, which I printed last time, by installing the requisite screws and such. I can probably work on putting things in the airframe to a degree as well. Chesley, I’ll plan to attend tomorrow. I have a huge arsenal of LiPos and can loan one for this project. We’ll need to determine ideal capacity/voltage. Harold and Nick discussed getting together on Sunday to put together and fly the glider. Whether I can make it depends on when I’m going to Scarborough this weekend; if I go on Saturday (questionable due to rain), then I’ll be open Sunday and will make it. Checking Waxahachie weather, it looks like I might go Saturday, so barring unforeseen changes I expect to be able to make it Sunday. The cutter had a too-short hinge bolt, but otherwise looks waay better than hand-wrapping NiChrome. I don’t know if Harold ran the FET circuit after I left, but he did build it. Nick got the Pixhawk relay functioning so it can trigger the cutter. So we are close to done with the cutter circuit. I liked Harold’s drone attachment method: fishing line only, line goes to an internal hardpoint and passes through the cutter out the rear of the craft. Simple. We believe someone walked out the door with the committee’s Ardupilot and APRS system. We will be looking into locked storage, now. In the meantime, I’ve volunteered my Pixhawk for testing purposes; haven’t committed to launching it though. For APRS, I don’t know what to do. If we want another system, we could always do something like this: http://www.byonics.com/mt-1000. But that’s a bit expensive. The spare balloons are on hold until we get the drone assembled and launch weight is known again. We may deviate from 350g (balloon size) if our weight is really off. Nick got a Dragon Link, and was talking about putting that on the aircraft. Looking at their website … that may solve the missing APRS problem. Hmm. We need to be working specifically towards 1.) electronics integration / putting things in the airframe and 2.) a power test so we can pick the right battery. The purpose of the Sunday meeting is to put the servos, a basic power supply, and a receiver in the aircraft, drop it, and fly manually so as to ascertain its flying qualities; if there is time, then integration of the Pixhawk and cutter and having the drone cut itself away from the tow drone will be the stretch goal. So ideally, the only thing left construction-wise after Sunday would be integrating various cameras and radios. I was talking to Jay last time about putting the GoPro in the nose and possibly on a gimbal (at least on the elevation axis). I thought the gimbal would be very nice to have to get consistently decent shots of the horizon; he insisted the gimbal would actually be necessary. I like the gimbal idea, but we have done no work so far on this. I forgot that my in-laws are in town on Sunday, so that won’t work for me. The weather for Saturday afternoon looks good, so we can shoot for the glide test then. The plan is to meet up to install servos, receiver, battery, and wire cutter on the glider, and then go test it by dropping it from a drone. 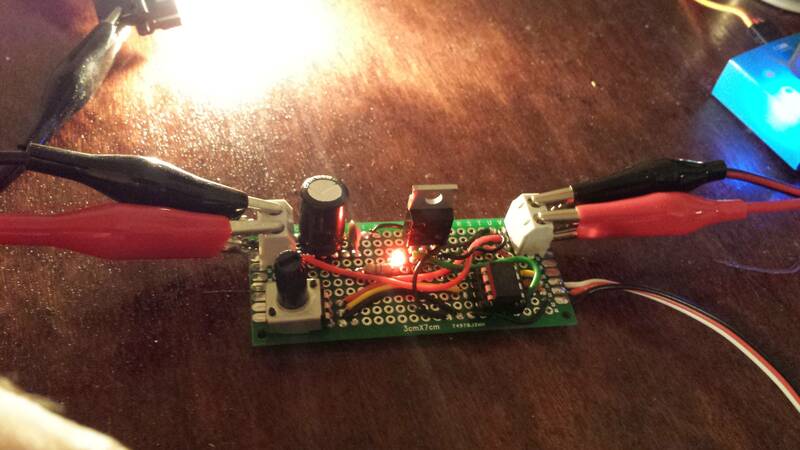 Nick and I did test the wire cutter circuit using two power supplies (12V and 3.3V), and it worked great. However, the current-limiting resistors still get hot fast. I am going to build an improved circuit that uses PWM control to the MOSFET, rather than current-limiting resistors. This way uses less power, but should also give us a circuit that could be left on for a while with no risk of burning out. I’ll have this ready for the glide test this weekend. Harold has a conflict on Sunday, so now we’re looking towards Saturday for building/testing. We’ll need to meet and pick up the Pixhawk if you’re unable to attend. Regarding APRS/DragonLink. DragonLink is only for RC control, it does not provide a channel for returned Telemetry. We do have have telemetry returning on a seperate 3DR telemetry radio (or RFD900). The advantage of the APRS system (before it went AWOL), was that it fully seperate/redundant radio providing only GPS coordinates, and it’s transmissions could be recieved by multiple ground stations, including automated APRS->Internet gateways. We can fly without APRS, but we’ll have a higher risk when it comes to recovery. Regarding the GoPro/Gimbal, I firmly believe a fixed-mounted GoPro/action camera is the best approach. A brushless gimbal will add 250g+ to the weight of our aircraft, and drastically affect flight performance, not to mention the added cost and complexity. We could use a servo gimbal instead of brushless - using a couple 9g digital servos should be fairly smooth but much lighter than one using brushless motors. If we want, we can put the small FPV camera on a servo (I use just a pan servo with my RC plane), but keep the GoPro fixed. I just finished the control board for the hot-wire cutdown. 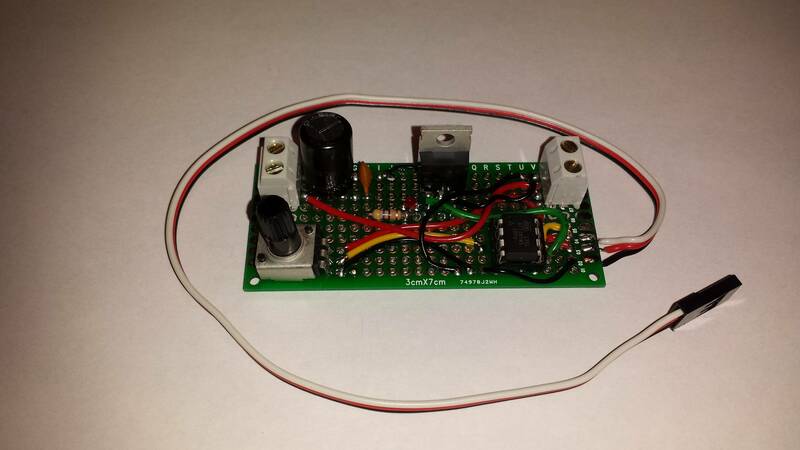 It uses PWM to adjust the average current/voltage to the wire, rather than using current-limiting resistors. There is a potentiometer onboard for adjusting power to the nichrome wire. It reads a standard RC channel signal. This will allow us to test the cutdown system using any RC receiver, no APM/Pixhawk required. I also added an LED on the PWM output, so we can see whether or not the output is on, and also get some type of feedback for the power adjustment. Oh, now that is nice. Many good things I will post later. Important thing to note though is we discussed and decided to meet this coming Wednesday (that is, accelerate the next meeting 1 week). The plane dropped well, so we’re all happy about that. I got some video of the first test of the release mechanism. Reminder: meeting tomorrow at 7pm. I need to talk to the chair of Science before next week’s meeting to see if we can do partial vacuum and if the machine has food safety issues we need to consider, etc. Essentially, this is details on the electronics. Once we get things sorted out, we can have another build day, where we can hopefully have the electronics working by the end of it. Also, the next meeting is next week, not this week. Reminder that the meeting is tonight at 7pm. Harold got the new ArduPilot for the committe, so we won’t have to rely on my PixHawk. Nick and Harold put a lot of work into getting the electronics functioning; I left while they were testing the servo configuration / stabilizer setup. There was some discussion about getting a different, more PixHawk-like autopilot, since Nick’s more familiar with that, but I’m not sure how far that got. We still need to get the right adapters for our power connections, but we were able to make do with what we had at the time. Still no word from Science about the freeze dryer. We had a discussion about cold / low density testing, and it’s still mostly felt to be a “nice to have” rather than a need. That being said, I intend to call Matt and discuss just to finish exploring that avenue. Alternate heating methods were discussed. Hand warmers were probably the most emphatically argued. The simplest way was to attach the video transceiver (which is expected to get hot) to the battery. Without a way to test, we’ll just have to fly it and see. Jay’s antenna tracker is looking nice. He was missing a piece of the elevation servo, but otherwise seemed to have it mostly together. I think he was able to find the Ghetto Tracker wiki and get the info he needed. Next meeting will probably be dedicated to further electronics integration work, like getting OSD, telemetry, the GoPro, and maybe the Dragon Link working. I had meant to discuss Aero / RC stuff with Harold, but forgot. Oh well, not a huge deal. So I missed this past weeks meeting. Talk hasn’t been working at work, so I didn’t get a chance to say anything. Did anyone show up and do anything without me? Ok, I can’t remember the schedule. I think there was supposed to be a meeting last week according to the original cadence, but I oopsed that pretty hard. Since last meeting, I was able to get a definite “no” from Science regarding using the freeze dryer. Last I remember, we were working on getting the electronics built and / or integrated. @hasbridge, is the new circuit you were planning on building available? @Nick_McCarthy, can you come and bring the Dragon Link again? And if you didn’t bring the GoPro before, that too?